GUJCET Admit Card 2018: Gujarat Secondary and Higher Secondary Education Board (GSEB) are going to conduct Gujarat Common Entrance Test on 23rd April 2018. GUJCET Admit Card for candidates going to appear in exam is now available at the official website. Candidates can now download their GUJCET Admission Card by visiting the official website and following instructions given below. After downloading the GSEB GUJCET Admit Card 2018 candidates are advised to check the details available on it carefully and completely. In case if candidates found any mismatch between exact details and details printed on GUJCET Hall Ticket then they are advised to contact the exam authorities instantaneously. The candidates will able to download the GUJCET Hall Ticket Online by log on to the official website of Board by using registration number and password. A copy of GUJCET Hall Ticket should be brought to examination hall at the time of examination. The Gujarat Common Entrance Test covers the syllabus from Physics, Chemistry Mathematics/Biology based on the syllabus of Class XII. There are total 120 multiple choice Questions of 1 mark each. In order to acquire complete details regarding GUJCET Admit Card 2018 Go through this page of which is prepared by the team of www.privatejobshub.in. You can also check out the direct link available below. Thereafter on the home page select and hit on GUJCET Hall Ticket link to get the Gujarat Common Entrance Test [GUJCET 2018] Admit Card. 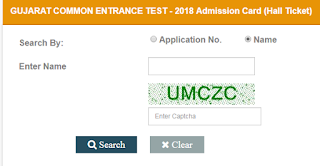 Within seconds you GUJCET 2018 Examination call letter will appear on your screen. Candidates are suggested go through it and check the details written in admit card. Finally, download Gujarat Common Entrance Test admit card and take the print out of the same as it is necessary to carry at the time of examination. Get here>> GUJCET Admit Card Download Link. GUJCET question paper will be comprised of total 120 questions. Only multiple choice questions having four alternatives will be asked in Gujarat Common Entrance Test. The subjects covered under the examination are Physics, Chemistry and Mathematics/Biology. Examination will be of maximum 120 marks. Examination will be 3 hours long. There is a system of Negative Marking in GUJCET. 0.25 marks will be deducted for each incorrect answer. The Gujarat Secondary and Higher Secondary Education Board will Soon issue call letters for Gujarat Common Entrance Test. Candidates can get it by going through online mode or can keep a regular eye on our web page as we will update the page as soon as the Gujarat Secondary and Higher Secondary Education Board will announce the admit card. Qualified candidates in Gujarat Common Entrance Test will be further called for GUJCET Counseling for final admission of candidates. It is mandatory to carry all required documents and certificates at the time of counseling for verification process. This is the exclusive page of www.privatejobshub.in hope the above provided information will helpful for you. You can also get your GUJCET Admit Card 2018 by going through official website of the Gujarat Secondary and Higher Secondary Education Board. If you want to get latest updates at your email then do subscribe our free mail services by submitting your email Id with us. You can also follow us on YouTube, goggle plus and twitter.